Billy Casper was one of the most prolific tournament winners on the PGA Tour from the mid-1950s to the mid-1970s. Respected for his extraordinary putting and short-game skills, Casper was a superior strategist who overcame his distance disadvantages against longer-hitting competitors such as Arnold Palmer and Jack Nicklaus with moxie, creative shot-making, and clever golf-course management abilities. Casper was inducted to the World Golf Hall of Fame in 1978. 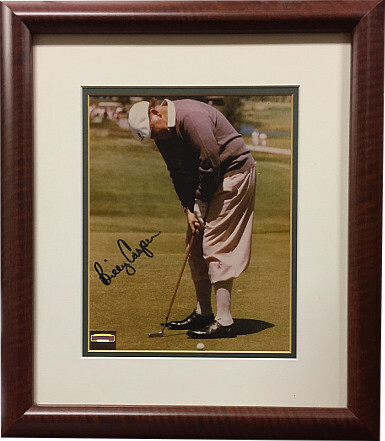 Billy Casper has hand signed this 8x10 Photo. Premium Custom Framed and Matted. Mounted Memories Hologram and Certificate of Authenticity from Athlon Sports Collectibles.